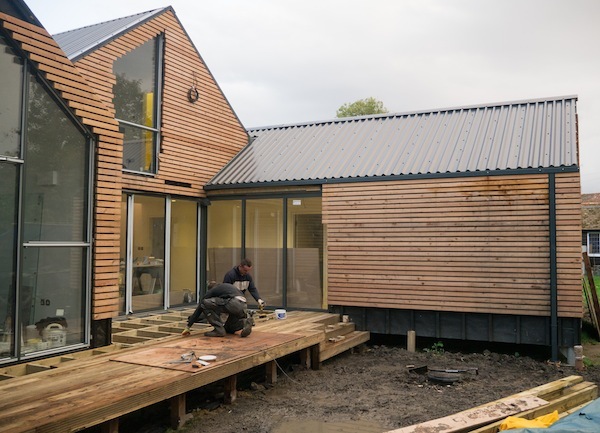 Baca’s Brook Street flood-resilient home is close to completion and will be ready to welcome it’s family-owners in time for Christmas. The main structure has been completed with finishing touches to the interior and landscape now underway. The elevated building, located in an historic Oxfordshire village, is situated next to a brook that can flood during periods of heavy rain. During a flood, water is conveyed underneath the house, yet in dry periods its elevated nature means the house appears to float above the surrounding wildflower meadow. The sculpted landscape enables water storage and provides a gradual warning of an approaching flood. The family home is low in profile and simple in form with a nod to converted barns in the area; the series of interlocking buildings, clad in timber, glass and steel, provide open-plan living space that also manages to maintain the intimacy of separate rooms.